When thirty-five year old Anastasio Hernandez Rojas was beaten and tasered to death by the border patrol, an incident that the San Diego coroner’s office ruled was a homicide, he was one of more than a dozen migrants who have been killed by the border patrol under questionable circumstances in the past two years. 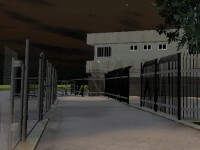 Those deaths have recently led the Department of Justice’s Office of the Inspector to initiate a review into the border patrols’ “Use of Force protocols.” This immersive documentary plans to highlight and create awareness of the dehumanization of migrants on our borders using a revolutionary immersive nonfiction story that employs gaming and virtual reality technologies to tell the narrative. By putting the audience on scene at the harrowing night of Hernandez Rojas death, Use of Force Protocol will provide a deeper understanding of what’s happening on our borders.